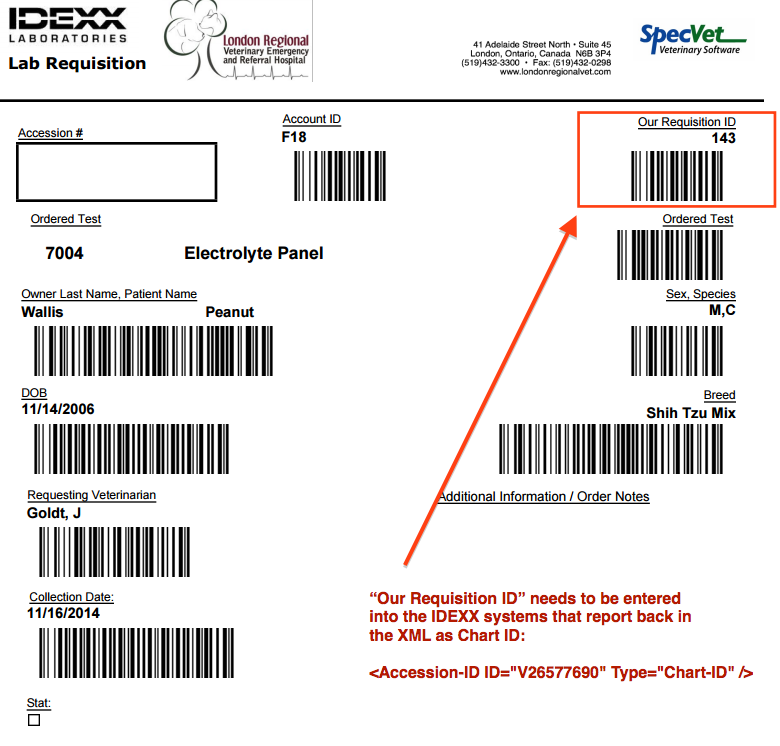 SpecVet software will prepare paper based requisitions for IDEXX Reference Labs. When in SpecVet, and performing/submitting the Orders the requisition will print at that time. Our requisition forms were prepared with collaboration of IDEXX, and was put together in the same format/order that they use for their data entry. IDEXX STAFF: It is important for you to utilize the “Our Requisition ID” as the value that you enter as the “Form ID”. This ensures that we will be able to match the results up to theproper ordered test/patient. Please see the attached sample requisition. Additionally, when requesting multiple tests that use the same set of samples, you willreceive multiple printed requisitions. When IDEXX receives it, they may “combine”those tests into a single requisition. SpecVet will receive the results for all of the testsunder just one SpecVet “Order”. The other Order will need to be manually statused. As an example: CBC and Chem are ordered [along with two Order/Requistion IDs (e.g., 125 & 126) ; two requisitions are printed and placed with the samples. When IDEXX receives the samples they may enterboth together (e.g., under 125). When SpecVet receives results from IDEXX, both the CBC and the Chem will come into SpecVet and the Order #125 will be statused as “Results Received”; Order #126 will be left at submitted and is then needed to be manually statused to complete that Order. If at any time the clinic decides to do an “Add-On” test to an existing Accession atIDEXX, the must create an Order for that “Add-On” test and then provide the Order # to the IDEXX staff and indicate that this is our “Requisition or Form ID”. The order number can be found in the bottom left corner of the Order record. In the example below, it is Order ID #6. At no time shall there be IDEXX tests submitted without generating a SpecVet order prior.